Michael Soward, music producer of cutting edge music for almost 30 years, has released his first novel, "Life-ology 101". The book is receiving acclaim nation-wide for being an inspirational story of transformation and the power of the smile. His mother died in a hospital when he was two months of becoming two years old. His grandmother then takes him along with his younger brother to her hometown of Blytheville, Arkansas where she would raise them. He then shares how his early life in the south along with grandmother Eva's constant beatings and whippings came to scare and affect him so deeply mentally, physically, and spiritually later in life. He experienced many trials and tribulations that many an African American faced by the nature of their skin color rather than for who they were or what they did. But American society was evolving and with Michael Soward's indomitable spirit he overcame these obstacles by sticking to his philosophy of smiling into the face of adversity and never giving in. He eventually discovers that smiling would become one of the great medicines of his life as a powerful future would continue to unfold. 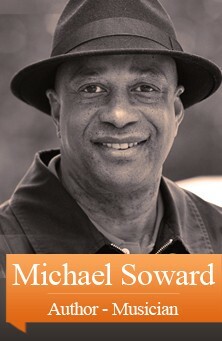 Michael Soward currently lives and serves in New York as an independent nationwide consultant for aspiring Gospel and Jazz artist and writers. He continues to help build careers and recording products within these industries through his persistence, knowledge of these markets, promotion and marketing skills.